Every year thousands of photographers flock to Passu Giau to capture the insanely photogenic Mount Ra Gusela and the curvy road running right at its footstep. Few realize that its summit is relatively easy accessible thanks to the beginner via ferrata of the same name. 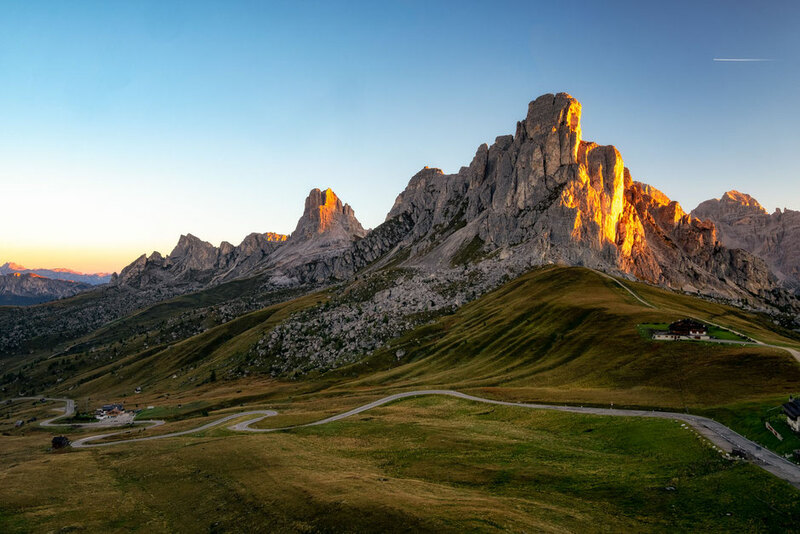 So put your helmet on, strap your harness, clip on your lanyard and get ready for some of the best sunrise views in the Dolomites! Via ferrata Ra Gusela starts at Passo Giau. It can be turned into a loop and walked either clockwise or counterclockwise. In this post I will cover the latter. 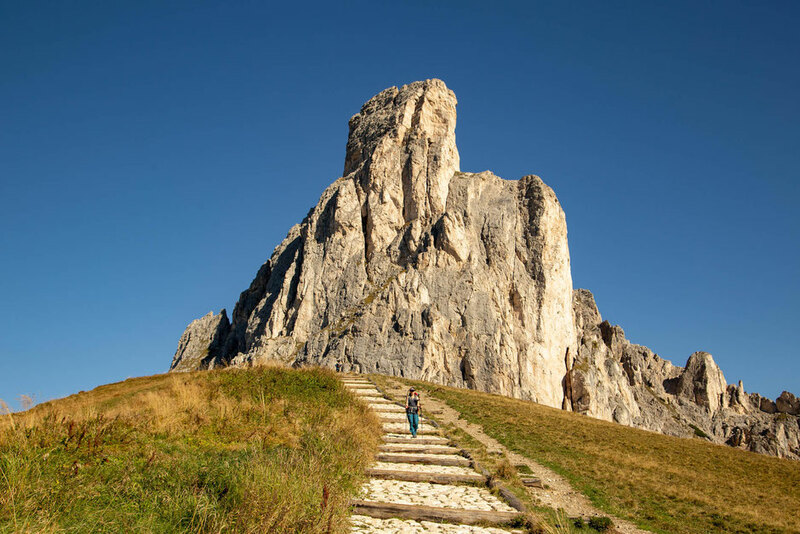 The pass can be reached in 30 minutes by car from Cortina D'Ampezzo - the nearest town. Before you set off though, make sure you are a confident driver. 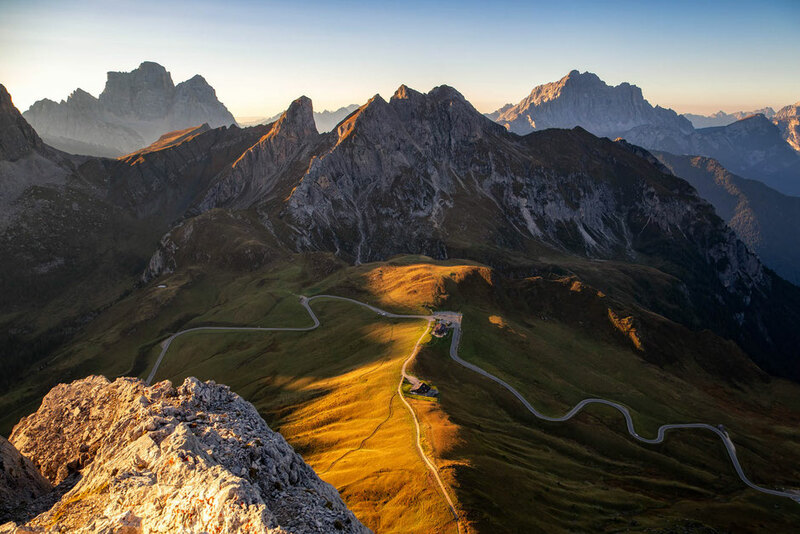 The mountain roads in the Dolomites are very narrow and full of hairpin bends. I have already clipped a side mirror in my van once. On the weekends the roads fill up with death-wishing motorcyclist, who are very keen to overtake you. You know, as if it wasn't already difficult enough. 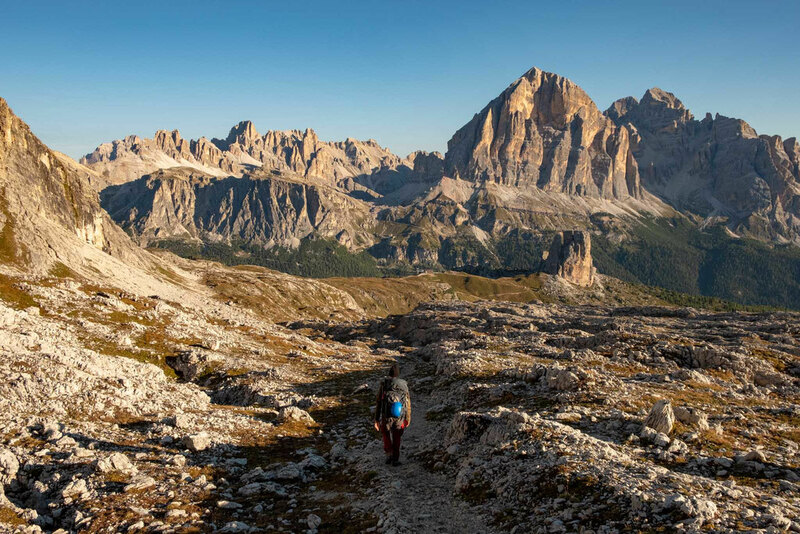 From Passo Giau take the prominent cobblestone path toward mount Ra Gusela. After ca. 100 metres you will get to a sign pointing right toward Via Ferrata "Nuvolau" (path nr 438). 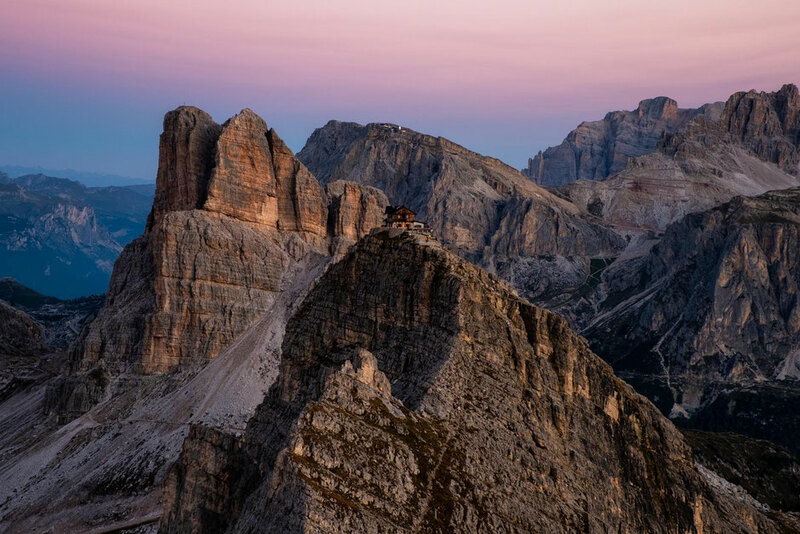 This is another name the ferrata Ra Gusela is known for and it takes its name from Nuvolau - the second summit the ferrata leads to. 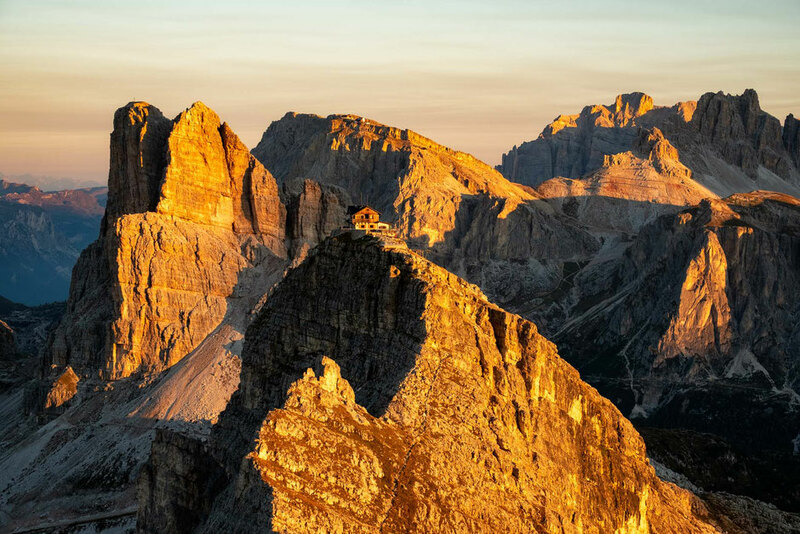 On its top stands one of the oldest and most photogenic mountain huts in the Dolomites. The rifugio bears the same name as the summit it stands on - Nuvolau. Back to the path. The ferrata initially scales the eastern side of Ra Gusela and it's really straightforward and, as per usual, marked with red/white paintmarks. The cable protection is intermittent. After around 40 minutes of scrambling you will reach a fork. Ra Gusela summit will be to your left and Nuvolau to your right. Mount Averau and Rifugio Nuvolau in the first morning light. I recommend that you first tick off the summit of Ra Gusela. 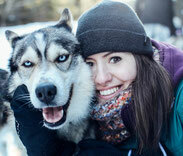 Although two summits in one day may sound like a lot, don't worry, it isn't. The elevation changes aren't too great. Between Passo Giau and the highest point it's merely 350 metres difference in elevation, so it's not like you will be climbing Everest and Lhotse in one day. 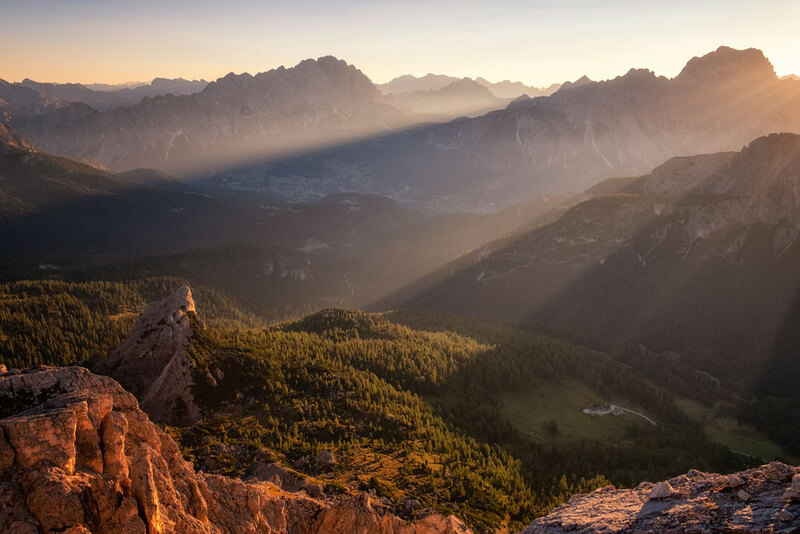 Brace yourself for some jaw dropping views upon reaching the summit. It's a 360 degree panorama including Tofane, Cristallo and Sorapiss groups. 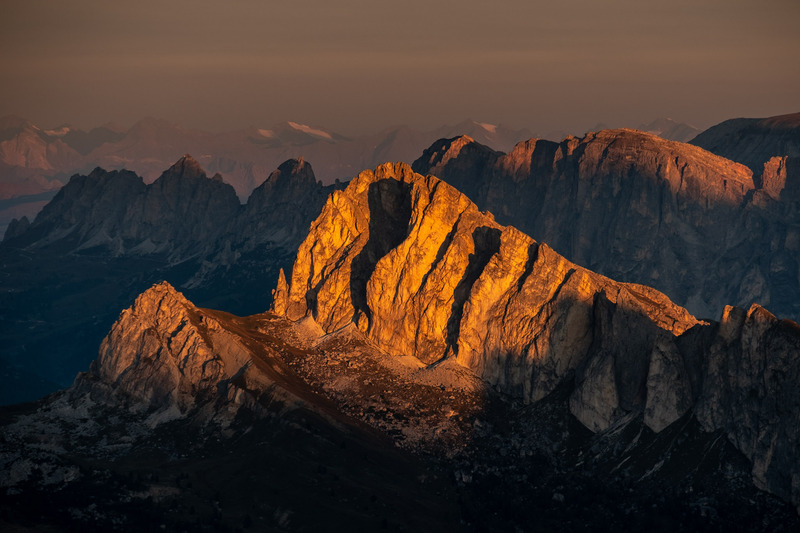 Mount Pelmo, Mount Civetta and even Marmolada - Dolomite's highest peak can also be see in the distance. Passo Giau, where you started will be visible down below. 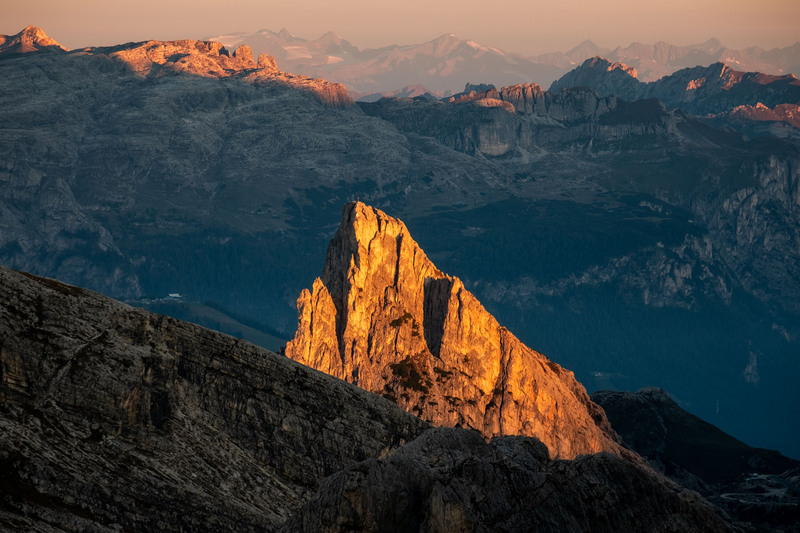 early morning light rays across the Cristallo and Sorapiss ranges. Cortina D'Ampezzo can be seen in the far distance. After a break at the summit it's time to descent along the same path you just came up on, then head over to the other side to the Nuvolau summit and check out the rifugio. From the summit of Ra Gusela you will be able to spot the path leading to Nuvolau. You will first drop down around 100 metres before climbing up again along series of ladders and few cable protected sections. The hut is a perfect place for lunch before you continue on with your day. Who needs a fancy top floor bar in some overpopulated city, when for a fraction of the price you can sip your beer on an outdoor terrace looking at beautiful views and breathing the crispy mountain air? A pint or two later it's time to descent. From rifugio Nuvolau continue along path nr 438. this time marked for rifugio Averau. It's a quick 30 minutes hike down to the hut. Short and painless. Feeling energetic? You have a chance to extend your day. By adding only 2 hours to the itinerary you can get to the summit of Mount Averau along the via ferrata of the same name. Read all about it here. If however you are ready to call it a day, from rifugio Averau follow path nr 452 towards Passo Giau. You should reach your car after 1,5 hour of mostly downhill hiking along a well maintained path. I recommend getting Tabacco map nr 03 and studying the map before setting off to better visualise the whole route. 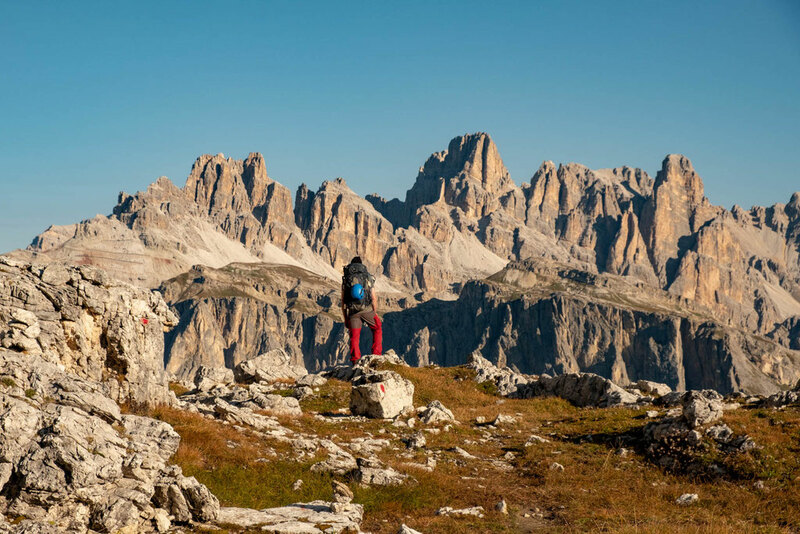 Are you planning a trip to the Dolomites and would like to know more about via ferrata Ra Gusela or anything else? Post your questions in the comments. I will be happy to answer them!